`Thy Kingdom come! Thy will be done on Earth! As it is in Heaven! A message from the Biblical prayer. The novel, `Life is Enchanting`, depicts the beautiful world of a happy family, leading an enchanting life of love, compassion and virtue; under the roof of beauteous philanthropic woman and her scholarly husband; who had aspired to lead the nation; keeping in view peaceful co-existence of human civilization in this Electronic Nuclear Age; which, he firmly believed, `is bringing God`s Kingdom on Earth at His Will`; and that it would materialize by His real Virtue. However, evil elements of democracy stubbornly advocated, that by the blessings of God, human civilization had survived and prospered; and that vast empires had been established because of inhumane, anarchic administrations and strategies of rulers. Thus, the unprincipled democratic leaders challenged to reign supreme over the nation; holding the noble leader`s family to ransom, by causing them acute distress of impending deaths `at the will of God!` rashly disregarding his political and spiritual dogmas such as: `Sufferings, caused by God`, are for the greater good of civilization. They are the deeds of His Virtue. Firmly condemning this logic, the Gandhian leader in the end made them realize that rulers of nations have to be intellectually and morally powerful, beyond any perceptible doubt; to welcome on this planet, the most tempestuous and gloriously enchanting era that prevailed during the Kingdom of God on this planet. If rulers failed, the end of the world would be imminent because of the hoardings of nuclear weapons and the satanic greed to reign supreme. The philanthropic woman substantiated this logic by averting the tragic deaths even of the satanic political activists, tactfully harnessing her Gandhian compassion and non-violence by means of WISDOM! Endowed by God on man for unaccountable virtues! One being the great karma of welcoming His Kingdom on Earth! Which is being accomplished at tempestuous speed by SCIENCE! Science will change man intellectually and morally, paving his path to his eternal salvation! It will handle terrorism, corruption and also democracy! I believe that you will enjoy reading this work of mine and serve in its humble capacity, His Purpose. B.K. Chaudhuri was born on 1st May 1925, in a well-to-do family at Madh island, Mumbai. He was a freedom fighter, took part in the freedom struggle and went to jail in 1942. Later in the year 1974, he was honoured by the chief minister of Mumbai, Mr. Vasantdada Patil with a Tamrapatra`. 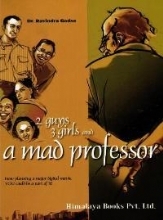 He worked as a teacher in the St. Xaviers High School, Vileparle, till he retired. He was an accomplished artist; his speciality being of oil paintings on canvas wood with his bare fingers. He Kept himself occupied with his hobbies for writing plays in Marathi. He also staged some Marathi dramas like `Jevha Avtarli Nari`. 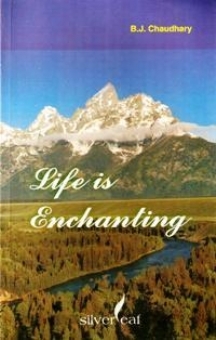 Life is Enchanting was his first English novel, was very dear to him till his last breath on 5/11/2011. He was into fitness and he continued with his exercise regime right upto his death.